Your career is at a standstill. Your savings are just enough. Your family is on board. You’ve done the research. You’ve been dreaming about it for years. It’s something you can finally do—open your own restaurant. But do you want to pull the trigger? You’ve heard all the horror stories of opening a restaurant, but also seen the lucky ones who’ve gone on to build thriving businesses, and you just know that if you could have your shot, you’d be part of the latter. Right? 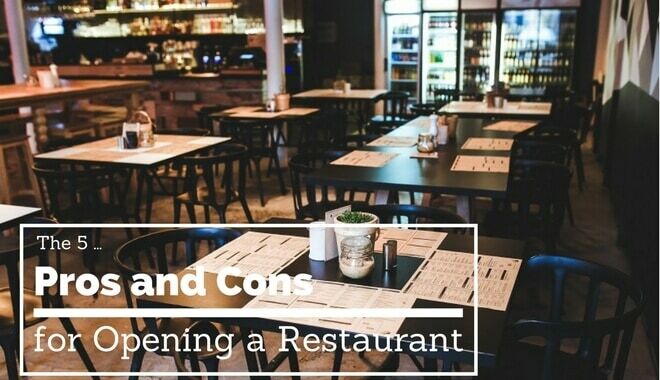 Here are five realities you will face when you open a restaurant, and the five pros and cons that go with them. When you open your restaurant, that’s it. You’re out of the corporate world or the retail world or whatever world you came from. You will no longer have a boss. Pro – You ARE your own boss: And that means you become your own boss. Every decision you make comes from you. You will no longer be ordered around like a dog chasing a salary; your purposes will feel defined, and that definition will come from your love for your restaurant. Becoming your own boss can be one of the most freeing experiences you can ever have, like a hamster finally getting off of that treadmill. Con – You have no boss: But let’s make this clear: you have no boss. This means every action, every task, every strenuous thing you do has to come from inside of you. Are you the type of person who can work without someone with a whip behind you, without the fear of being fired? Some people are, some people aren’t. If you don’t know yourself well enough, you could end up freeing yourself from the shackles of a boss, only to realize that you don’t want to work at all. Every dollar that comes in is a dollar that was made because you made it. No more salary, no more wage—the sky is the limit. You’ll see it as soon as you start: you work harder, and you earn more (ideally, at least). Pro – You could build your own empire: With no more weekly or monthly fixed salary coming in, there’s no reason why you can’t keep raising your own ceiling higher and higher. The possibilities become endless when you take your mind out of the usual “What’s my monthly salary?” mindset. When you realize that your salary is completely dependent on the effort that you put in, and not fixed on a month-per-month basis, you might finally have that extreme motivation to keep going up, and up, and up, until you’re rolling in the millions. Con – You could lose everything: But you have to be realistic with yourself. Like the first point, a lot of us need that knowledge that there’s always a boss hovering above us, or in this case, a salary to fall back to as a safety net every month. When you realize that your effort directly translates into the dollars coming in, you might lose it; the stress could kill you, literally and figuratively. You’ll keep yourself up late at night, wondering if you’ve done enough to feed your family, even if all you do is work. Restaurants are all about pleasing people, with your service and your food. Because your restaurant lives and dies on your customers’ opinions, through word-of-mouth and online reviews. Make people happy, and they’ll keep coming back. Pro – You can charm everyone you meet: If you’ve always been the heart of the party, the socialite who knows everyone’s names and has everyone’s number, then running a restaurant will be a breeze for you (on the customer experience side of things). Charm is a huge asset when it comes to running a restaurant, because you want to keep customers smiling, always. If you’re already inherently loaded with more charm you can handle, then you already know exactly what to do for those 5 star reviews. Con – You might not be a people person: But again, not everyone is a charmer. Some of us are more introverted and quiet; we keep to ourselves and hide away. You might be more into the cooking side of things, or the analytics, or maybe you just want to watch everything from above. If you can’t get a manager with the social skills to charm your customers, you might find yourself overly stressed out over having to charm them yourselves, so much so that you’ll start driving them away. No more driving through traffic. No more waking up at five in the morning. No more tight suits. No more strange-smelling open offices. No more co-workers you can’t stand. As a restaurant owner, you won’t have regular 9 to 5 working hours, or regular duties like company policy meetings or company retreats. Your life becomes yours. Pro – You can work whenever you want: Your life becomes yours, meaning your hours become yours. If you don’t want to get up and open your restaurant, have your staff do it for you, and come in at noon instead of seven. Jump in and out of the restaurant as you please; you’re not constantly under surveillance anymore by a strict boss. Your day becomes yours, your freedom finally fulfilled. Con – You might be working all the time: But just because you can do these things doesn’t mean you should. Unless you’re Colonel Sanders himself, you’re probably not at the top of a restaurant franchise empire. You might have a small staff who doesn’t entirely know what to do. Most restaurant owners are incredibly hands-on, and have to spend over twelve hours a day doing every duty possible at their restaurant, just to make ends meet. Just because you got out of office work doesn’t mean life’s going to be a vacation. In a perfect world, we would all be working jobs that we love and that make us feel fulfilled. But with nearly eight billion people on the planet, it would take the work of a genius to assign each of us to the exact eight billion jobs that reward each of us with satisfaction. For most of us, we work a job we don’t like, progressing down a career we couldn’t care less about. Pro – You get to build what you love: No one opens a restaurant without the passion to do so, meaning every restaurant owner out there is doing what he or she loves. And this is one of the best things you could ever accomplish—going into work every single day, not because you have to or else your boss will yell at you, but because you want to and because you love what you’re building. Seeing your restaurant grow from a 5-employee establishment to potentially something that you will one day expand is like watching your own child go off to college. Every day you will be building what you love. Con – You might get sick of it: But like any parent-child relationship, things can go sour pretty fast if you don’t know what you’re in store for. With long hours, restless nights, more stress and bills and number-crunching than you’ve ever known, there will be many, many times when you ask yourself: Why am I doing this? In a year, you might be pining for that office job you thought you hated.